Here’s a guest post from 2 Minute GMAT, enjoy! A lot of students interested in business school ask what GMAT score they should reach for. They wonder whether a 700 on the GMAT will be enough, what will happen if they can’t improve their quantitative score, and so on. There are a number of ways to answer what GMAT score a candidate should aim for, but a good rule of thumb is to have a score at least in the range that includes the middle 80% of the business school you would like to attend. You should look to the higher end of this range because certain profiles can have lower GMAT scores and still be accepted. A female Brazilian applicant whose native language is Portuguese may not need to score as well on the verbal section as a native English applicant. Although not everyone can reach this range, understand that if you are below this range, you will have to work harder on the rest of your application though. Two important reasons why you should maximize your score on the GMAT are because of the resources available and because an MBA program will only see your highest test score. 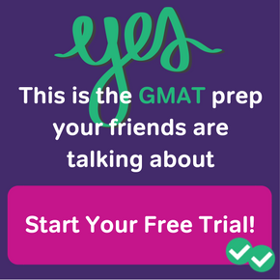 First, in regards to the resources available, MBA.com, the official GMAT website, offers 2 free official GMAT tests. These provide great insight into the GMAT questions you will see on test day. Several companies, including Manhattan GMAT and Kaplan, provide helpful insight into the strategies you can take to solve each type of question. There are specific steps you can take to narrow down answer choices and improve your chances of a correct answer. Second, an MBA program admissions member will see your GMAT test score differently than how an undergraduate university would consider an SAT score. Unlike the SAT and LSAT test, the GMAT is a self-reported score. What this means is that for your business school application, you will be asked to fill out your highest test score and the score you report will be the only one that an admissions member will see when they accept you into the incoming class. 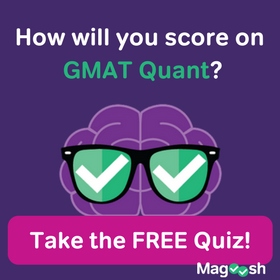 Only after you have been accepted will the business school confirm with GMAC, the creators of the GMAT test, that you had the GMAT score reported. There are a number of implications for this. First, understand that you should not cancel your GMAT score even if you don’t think you did well. Your score may have in fact exceeded your expectations. Second, remember that your highest GMAT score, the one that you report, is the only one that a business school will see. Even if you don’t do well on your first try at the GMAT, there will be other chances to take the test again. In fact, many companies recommend that you take the GMAT test at least two times. Taking the GMAT test a second time will not affect your initial score, and you will have more time to practice for the test. Founded in 2009, 2minuteGMAT guarantees that you will improve your GMAT score by 50 points or your money back. We send you a unique email every day for 3 months with 10 GMAT Questions of the Day (5 Math and 5 Verbal), a daily blurb about top business schools, and advice from experts on how to improve your GMAT score. 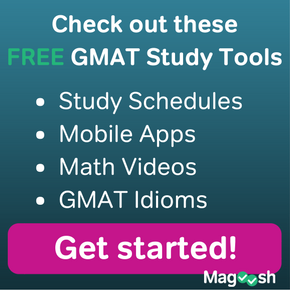 Visit the 2minuteGMAT blog for updates and GMAT tips. For more advice on improving your GMAT score, visit http://www.2minuteGMAT.com.